Public Transport: Not worth the high prices being charged. Every year we are seeing price increases for public transport and now it's to the point where it's exorbitantly costly and not worth the money. Fairly often the service quality does not increase at the same time as the prices do and consumers are left with the same old for more of their hard earned money. 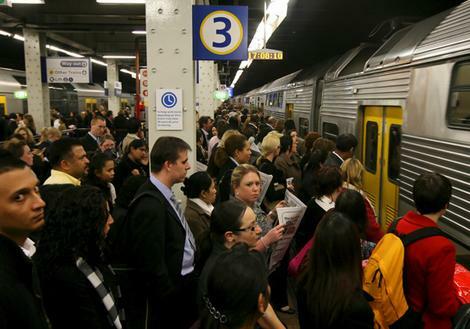 In CityRail's case prices went up and quality of service dropped, this has been evident over 3 consecutive years. Consumers are travelling on 40 year old train cars where the only maintenance has been some paint, new chairs and carpet on a small percentage of the trains. Most of the trains do not have air conditioning or fail to work when it matters the most. Prices are out of line and are not reasonable for what public transport is. A return ticket from the Central Coast to Sydney costs $18.60 ($9.30 per person each way). Driving a car from the Central Coast to Sydney also costs $9.30 each way. "People should only be catching a train for a cost reduction in travel expenses, and given the amount of people on a train going a similar direction the costs should be shared." Ridesharing is the answer, people need to get onboard with ridesharing, stop and rethink the public transport model. The public transport model has failed 90% of us and yet we still come back to it! Ridesharing is convenient because you have a vehicle that is not limited to a public transport route and not necessarily limited to a timetable. It's safer than public transport as you are able to screen and chat to the people you are travelling with before departing. As for public transport you never know who is going to get on the train. Ridesharing allows for a reduced cost trip with a far better experience. Not only will you be guaranteed a seat, chances are your ride will be on time. If we have 3 people in a car all sharing the cost of the trip from the Central Coast to Sydney each person pays $3.10 each way. This is the power of people collectively working together and sharing resources. Ridesharing is on the rise, while public transport has decreased by over 2% in the last 3 years. Lack of service continued to be one of the main reasons why people in Australia did not use public transport. 27% of people reported that there was no service available at the right time or at a convenient time. We need to stop paying premium prices for trains that run late, trains that start travelling 5km hour for 90% of the trip, trains that do not have air conditioning, trains that are so hot it's a health hazard and let's not get started with the quiet carriages where the guards regular announcements are more distracting than a drunk person yelling obscenities. In 2015 we all should start looking towards Ridesharing and not to the Australian Government for an answer.